Men in Trees made me cry tonight which is feebleminded and rubbish but there it is. Marin looks so vulnerable in her heidi hat. Jack was crap. Lynn was a douche. At least Patrick finally got it together so there was some light in the Darkest Day. Why is love so hard? And why do I care so much about what happens to some TV characters? The truth is I don’t really care about them because I know that it is not real. But that doesn’t stop me hurting when people hurt. And remembering what it is like to hurt like that. Not even That 70s Show could get me out of this funk. I would love to regale you with all the fabulous I watched last night but I actually watched Manchester United get beaten by Copenhagen in the Champions League which was well annoying. 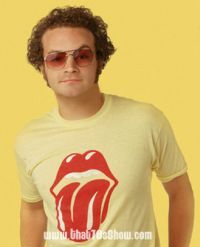 It also meant I only watched a couple of episodes of That 70s Show although they were particularly funny. 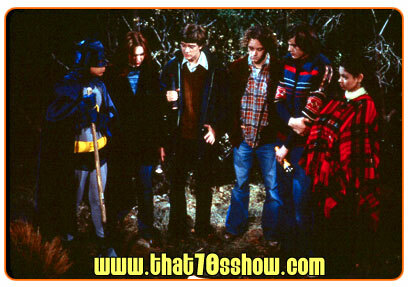 Eric takes drastic measures when he learns that everyone in the gang, including Kelso, has higher SAT scores. My favourite moment: Kelso getting a higher score than Eric. WAHHH!! Kitty throws a dinner party so Fez can introduce Nina to the gang, but the event turns into a battle of wills between the sexes. My favourite moment: Hyde getting dressed up all smart because he didn’t like Jackie going to the dinner party with Kelso. 7.33pm Turn on TV, Sky + box and go into kitchen to make tea. 7.36pm Settle down in front of TV with nachos from microwave and a bottle of red wine. I am nothing if not classy. It’s Thanksgiving, and with everyone at dinner, including Kitty’s mom and dad, Eric thinks it’s a perfect time to announce his engagement to Donna. My favourite moment: When Donna is so excited about being engaged she tells Eric that despite it being a secret, she couldn’t help but tell the pretzel vendor. Aw. When Jackie’s dad is sent to prison, she’s heartbroken when Hyde has no comforting words for her. Kelso’s having trouble accepting the fact that Hyde and Jackie are together. And Fez finds romance at the DMV. Original U.S. Air date: October 26, 1999. Shocking secrets are revealed when the kids find their permanent records during a Halloween visit to their old elementary school. Red and Kitty remember Halloween, 1957, the night Kitty finds out she’s pregnant. My favourite moment: Finding out Jackie’s middle name is Beulah. 8.49pm Watch The Daily Show with Jon Stewart. I do love that man. So brilliant. 11.05pm Watch Stealth. I know! Pretty bad, but I can’t help liking Josh Lucas. Such pretty blue eyes. I really want to have Sweet Home Alabama in my chickflick collection. From tomorrow, I have pledged to update every day for a month so I am going to have to get some serious TV watching in. For the past few days, literally all I have watched is That 70s Show which rarely warrants anything more than a cursory mention of Hyde’s weird hotness i.e. he is hot/cool on the show but not necessarily in pictures. See Exhibit A below. However, things are getting serious. I can’t just keep posting pictures of Danny Masterson every day. I think that would be cheating. I have no real qualms about updating my normal blog but this one is a bit more tricky… what with all the TV watching required and all… Oh well, wish me luck, people.